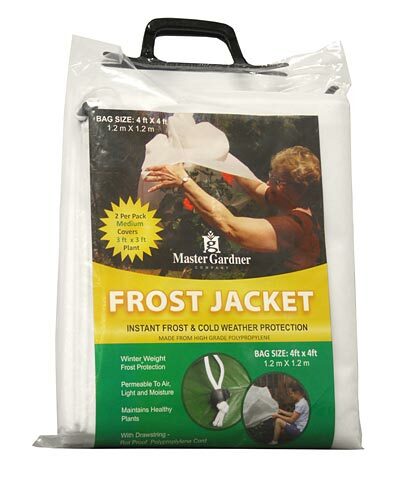 Help your prized plants withstand cold weather using the Master Gardner Frost Jacket. Covering your flowers or shrubs when frost is expected helps them stay warm overnight, preventing damage from cold to the roots and leaves. This high grade, polypropylene bag ensures a lasting cover, while its white color and innovative design allow air, light, and moisture to reach your shrub. Its winter weight keeps the air around the plant insulated, and covering flowers can keep insects and other pests away from them for less pesticide use. The drawstring on this unit enables you to tighten it around the plant, and its generous size can cover flowers up to 3' square. Protect your plants from frost damage with this Frost Jacket. Availability: 17 in Stock. Ships from OH within 24 business hours , 17 available at this price!